When it comes time to find replacement windows for your home, you have many brands from which to choose. Finding a window that suits your style, is energy efficient, and are affordable can be a challenge. Innovations by HOME GUARD® is the leading brand of replacement windows Indianapolis homeowners choose for their homes. It comes in many styles with options for colors, window grids, and more, plus it’s energy efficient. HOME GUARD® windows are made in the Amish community in northern Indiana and are well suited for our climate. When buying a replacement window, one of the most important things you can do to make sure it’s the right window for your home’s climate. The easiest way is to check the NFRC ratings on the window and make sure they fall within the guidelines for your region. 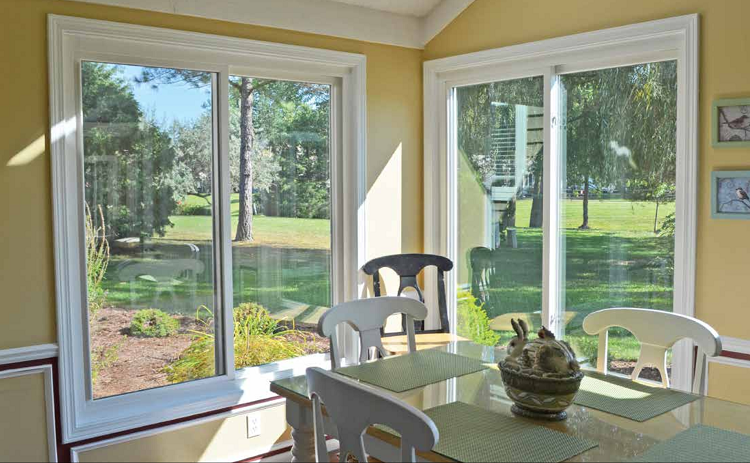 The double and triple pane options in the Innovations line meet or exceed the region’s recommendations and help keep you home a more consistent temperature than your old single pane windows. The features available in this line go far beyond most replacement windows. With over 20 colors including wood grain options for the exterior, you can find the perfect window frame color for your home. The double hung windows feature tilt in sashes for easy cleaning. The multiple window grid patterns and mutin bar options help you craft windows that highlight your home’s unique character. You’ll appreciate the many features often found only in significantly more expensive windows. Things like internal blinds and high efficiency insulated glass. And if you hate cleaning windows, you’ll truly appreciate the Clean/Guard low-maintenance glass that uses the sun’s UV rays to keep your windows cleaner longer. All the features and options don’t matter if the windows aren’t made to last. With an 8-point warranty, you have the peace of mind that your windows are warranted. And unlike many manufacturers, the HOME GUARD warranty is not pro-rated. These window is covered and the warranty is transferable if you sell your home. The Good Housekeeping seal of approval covers HOME GUARD windows. From patio to entry doors, HOME GUARD’s doors are made to look great and compliment your windows. Sliding doors are available in the same color vinyl and wood looks to coordinate with your windows. If you need a new entry door, HOME GUARD offers several styles of storm and entry doors. You can’t go wrong with the HOME GUARD brand. For expert installation of Innovations replacement windows Indianapolis homeowners have trusted Blair Windows & Doors since 1955. Call 317-356-4666 to schedule your free in-home estimate today.